There are not enough words in the English dictionary to describe how much I love this dish. It just screams home comfort and I love the fact that you can eat this on its own and feel 100 per cent satisfied. You can literally add whatever you want: fish, meat, veg… it doesn’t matter as it will all taste great. Think of it as a Chinese bubble and squeak – whatever you have in your fridge, lob it in! There are just a couple of rules to making fried rice that will guarantee a fabulous result. 1) Use day-old rice that has been cooled in the fridge. The reason for this is simple: rice that has sat overnight in the fridge will have dried out, whereas if you use hot, freshly cooked rice it will turn sticky and need a lot of oil to cook. 2) Don’t use too much oil. This dish has been given a bad reputation over the years because of the word ‘fried’ in its title. But it’s not deep-fried like chips. You only use as much oil as you would need to stir-fry the healthiest vegetable dish. That’s it . . . so simple. Viva La Rice! PREPARATION TIME 5 MINUTES. COOKING TIME 10 MINUTES. 1. Heat a wok until medium hot and add a dash of oil. Add the Chinese sausage slices and fry quickly on both sides until colouredall over, with the white parts turning pink. Remove and set aside. Beat the eggs in a bowl and season with salt and pepper. 2. Add 1 tablespoon of oil to the hot wok and pour in the beaten eggs. Scramble the eggs, scraping the bits that are sticking tothe wok. Aim for well-cooked scrambled egg that is separating into individual pieces. Once cooked, add the rice, scraping thebottom of the pan and tossing the rice as you heat it through. Once the rice is hot, add the remaining ingredients, except forthe sausage. Continue to cook over a medium heat, tossing and mixing. Once the anchovies are beginning to melt intothe hot rice, taste and season with pepper and a pinch of salt. Continue to stir-fry for 3–4 minutes, then taste and adjust theseasoning, adding more soy sauce if necessary. 3. 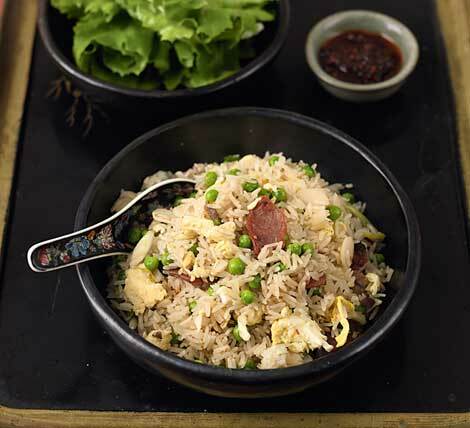 Serve the fried rice with the cooked Chinese sausage, chilli oil and lettuce, wrapping spoonfuls of the rice inside the lettuce leaves to eat.